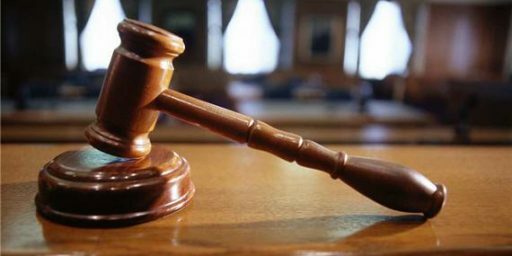 Kansas's highest court heard argument today in a legal dispute that could play a huge role in deciding who controls the Senate after November 4th. Kansas Supreme Court justices grilled Secretary of State Kris Kobach’s attorney at a special court hearing Tuesday about whether Democrat Chad Taylor should remain on ballot as a candidate for U.S. Senate. Taylor’s suit to remove his name from the ballot is unprecedented in Kansas history. Republicans see Taylor’s attempt to withdraw as a not-so-covert plan by national Democrats to boost Greg Orman’s independent candidacy against Republican incumbent U.S. Sen. Pat Roberts in November. 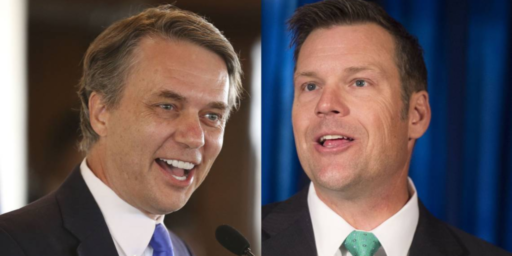 Democrats say that Kobach, a supporter of Roberts, has overstepped his bounds as secretary of state to keep Taylor on the ballot against his will. The suit hinges on whether Taylor adhered to a statute that requires candidates to declare that they are incapable of serving in order to withdraw. Earlier this month, Kobach determined that Taylor, the district attorney of Shawnee County, failed to do that in a letter he submitted to the Secretary of State’s Office on Sept. 3, the deadline to withdraw. Pedro Irigonegaray, Taylor’s attorney, argued that Kobach lacked the legal authority to make that determination because the statute does not specifically say that it’s up to the secretary of state to decide whether candidates have met the standard. He also contended that the statute does not specifically say the declaration has to be in writing. Edward Greim, who represented Kobach, argued that as the top election officer, Kobach has the power and duty to enforce the statute. “If it (the declaration) could be made at home to someone’s goldfish, then the statute is meaningless,” Greim said. However, Justice Lee Johnson said it’s the court’s role to interpret the plain language, not to provide meaningful enforcement. “We have to add language to get to your interpretation,” he told Greim. The justices flooded Greim with questions. Before Greim could describe why Taylor’s letter missed the requirements, Justice Carol Beier cut in with a question about another letter submitted to the Secretary of State’s Office by Miranda Rickel, a House candidate who withdrew from a race in District 5 this year. Rickel described in her letter how multi-year course work at Kansas State University and juggling jobs made it “nearly impossible” to mount a campaign. “Her letter says it will be ‘nearly impossible’…she does not say ‘incapable,’ ” Beier said. Greim said the letter contained facts that were tantamount to a declaration of incapability, but Irigonegaray said Rickel’s letter showed that she was incapable of running, not of serving. Greim said notarization was a side issue. While it is always hazardous to predict outcomes from oral argument (because Justices sometimes ask rhetorical questions or minds change after argument), I think it is likely the Justices will quickly issue an order removing Taylor’s name from the ballot. Nothing is a sure thing, but enough of the Justices speaking seemed to indicate their belief that Taylor should be allowed to withdraw because Taylor’s declaration of withdrawal complied with the statute (by stating he was withdrawing “pursuant to” the statute even if he did not mention the magic words of withdrawal), or substantially complied with the statute, or he complied because only the request to withdraw but not the declaration of incapability needs to be in writing, or because Kobach lacked the discretion to judge if the letter complied, or because the court should view Taylor’s declaration as complying with the statute to avoid the risk of voter confusion. Much of the discussion at oral argument concerned other letters of withdrawal which the SOS had received in recent years, including some earlier letters which were submitted (late) to the court. It seems to show a pattern of the SOS exercising discretion in deciding which letters complied. The Justices seemed to get Kobach’s lawyer to admit that substantial compliance may sometimes be enough. With that concession, there is a relatively easy path to finding the letter substantially complied. Nothing in the argument seemed to turn on whether Taylor received incorrect assurances that the letter was accurate from someone in the Secretary of State’s office. It looks like the Court will avoid the disputed factual issue by finding that the letter (substantially) complied with statutory requirements. As Hasen goes on to note, absentee and military ballots are scheduled to begin being printed on September 19th, and they will be required by law to be mailed out shortly after that. Given that deadline, the Justices in Kansas are on a very short timetable and will likely rule in the coming days on the issue. While Hasen is correct that one should not always judge the potential outcome of a case based on oral arguments, indeed that is something I’ve learned on a professional level myself over the past 20 years, it does some from all of the descriptions of the oral arguments that the Justices are inclined to give the law in question a strict construction that, potentially, could lead to a ruling that Taylor’s letter was sufficient under the law. Essentially, they seem to be hinting at the idea that the statute does not specifically state that the declaration that a candidate is unfit to fulfill the duties of office be set forth in the letter to the Secretary of State, nor does the statue state exactly what that letter must say. Additionally, the fact that other parts of the statute, including the requirement that the letter be sworn to before a Notary Public, have only been loosely enforced in the past suggests that the Secretary of State’s argument this time is motivated by something other than a desire for specific adherence to the statute. I hit upon this possible interpretation of the statute when I first wrote about the legal dispute that arose after Taylor’s attempt to remove his name from the ballot. If this is the direction the Court is headed, then it would appear that Taylor’s challenge to Kobach’s decision was a wise one. Independent Greg Orman has opened up a lead in his effort to unseat Republican Kansas Sen. Pat Roberts, according to a new poll from Democratic firm Public Policy Polling. In a head-to-head matchup, Orman’s lead grows to 10 percentage points, according to the poll. The poll is the first to show Orman with a clear lead, even with Taylor included among the pool of candidates. Taylor has attempted to withdraw from the race entirely and is suing to remove his name from the November ballot. Even more significantly, PPP did not prompt respondents about Taylor ending his campaign before conducting the ballot test. The majority of Taylor supporters said they know that he has asked to be removed from the ballot, and a subsequent question showed 63 percent of likely voters think he should be allowed to withdraw his name. This follows on the poll that was released last week that showed Roberts trailing Orman by one point, with Taylor garnering 10% of the vote. Assuming these numbers hold up, then Pat Roberts will officially be in trouble of losing re-election if he isn’t already. At that point, the GOP and third party groups are going to have to decide how much money they want to send into Kansas to try to save him, money that they will of course not be able to send to other candidates in other states where the GOP has a chance of winning a seat currently held by a Democrat. If they lose Kansas, though, then the Republicans may well find their dreams of winning control of the Senate dashed for the third election in a row. As unlikely as it may have seemed even a couple week ago, then, it does appear that Kansas is going to be a state to watch over the next 49 days. Yes, Kansas…while not actually deciding who controls the Senate…will be an easy one to point to on November 5th if that’s the way it goes. Clinton trotted out a new attack line, slamming McConnell for saying the worst day of his political career was when President George W. Bush signed the McCain-Feingold campaign finance legislation. “I was profoundly sad,” Clinton said of McConnell’s remarks. “When I look back on my life in politics, after all those decades and fights and all those campaigns, if the worst thing that ever happened to me was an attempt to limit black bag contributions?” Why not 9/11, the farm crisis, the loss of manufacturing jobs in the ’80s, or the loss of coal mining jobs in Kentucky? Clinton suggested. That McConnell could say “the worst thing that happened to you [in politics] was not being able to black bag unlimited amounts of money” was outrageous, the former president said. Ah, the ol’ nitty-gritty of law. Where anyone’s common sense on what the law says is undermined by the guys hoping to squeak by on technicalities. He forgot to use a particular phrase, so the whole law is off. That’s priceless. I mean, this seemed politically-motivated from the very beginning. I hope the justices shoot it down because I’m getting somewhat tired of “the literal letter of the law” being the standard of judgment around here. It’s pretty clear from what’s been presented that both the office of SoS and Kobach himself have _never_ held a letter like this to the stated standard. And considering that the Taylor campaign was assured by Kobach’s own lieutenant that the letter was sufficient, it looks very much like either Kobach by himself decided to pervert the authority of his own office to support his party’s candidate or the entire senior staff colluded to do the same thing. Kobach has been a scumbag for a long time, and it’s good that he get smacked down by the courts. Very few people can find the jugular as well as Bill Clinton. Actually because Orman is an independent…who he decides to caucus could very well decide who controls the Senate. (Check me on this but I’m not sure he has definitively said?) He could very well become one of the most important people in Washington if he plays his cards right. Sam Wang/PEC also has the House race at Republicans taking 9 seats….well below the predicted wave. If I’m Alison Grimes…I’m running a six-figure ad buy with that attack…over and over. Her bit with the gun is a killer too…pun intended. That’s good. That’s good for another C-note contribution. If they lose Kansas, though, then the Republicans may well find their dreams of winning control of the Senate dashed for the third election in a row. Other than stonetools, does anyone really think Orman will caucus with the Democrats? really? @edmondo: Pretty any political observer thinks that if the Democrats have 50 votes, he will join their caucus, and he basically said as much. I missed this in earlier discussions of this incident. To me that’s a pretty strong argument in Taylor’s favor. Kobach sounds like a douche. Yeah and Obama was against the mandate and for closing Guantanamo….and said as much and it was on his website too. I hit Hagen and Nunn as well. I hate to get my hopes up but I would surely like to retire Mitch McConnell. The best thing about that questioning is that it got to Kobach’s completely arbitrary (and, by implication, self-serving) interpretation of the law. “Loosey goosey” is an exceedingly polite way to put it under the circumstances, but in Judgespeak that’s tantamount to calling him a corrupt partisan hack. Which, now that I think of it, would also be an exceedingly polite way to describe a scumbag like Kobach. These predictions from watching the oral argument may be right. I hope they are–Kobach is an embarrassment. Having said that, two observations: 1. Tough questioning from this court doesn’t necessarily foreshadow anything. I argued a case before them this summer in which they tossed softballs to me and pounced on opposing counsel almost before she could get her name out, but when they wrote the opinion it was unanimously in her favor. 2. 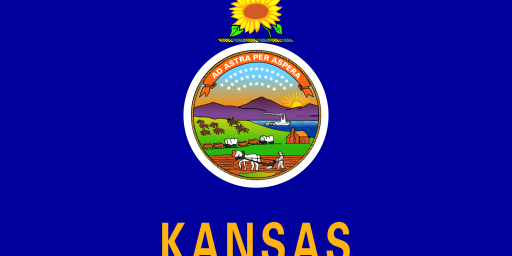 The hard right faction of the Republican party (which in Kansas is the majority faction) claims that the Supreme Court is in the pocket of liberals and lawyers (a claim that is patently untrue) and is making noises about changing the selection process for Supreme Court judges from a non-partisan merit system to appointment by the governor. Mr. Dooley said the Supreme Court follows the election returns. 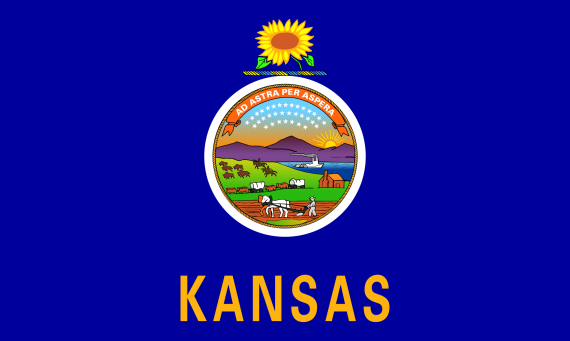 If the Kansas court follows the returns, it may be reluctant to give ammunition to proponents of that change with an opinion that will be painted as a political decision favoring the Democrats. @humanoid.panda: Yawn. The odds of a prochoice candidate surviving a Republican primary in Kansas are about as good as the odds of Single Payer and Ponies for Everyone Act passing into law in 2010, about zero, so Orman will have to think long and hard before joining the GOP. Seriously though, your mandate carping says something important about politicians. Decades of research tell us that the idea that they don’t follow through on promises is actually a myth. They compromise, of course, and sometimes pretend their promises have all upside no downside (like saying you can have community rating without some kind of mandate), but they do act to implement the core elements of their agenda. The ACA is case in point: all three Democratic candidates agreed on the general outlines of a health plan (and back then, having a mandate was considered the more left wing position, so Obama ran to the right of Clinton on that one), so that was clearly an item that had the core support of the party. Obama acted, and succeeded in implementing the party agenda, while compromising on some specifics, and tossing out the parts of his promises that were meant to distinguish him from his in-party opponents.